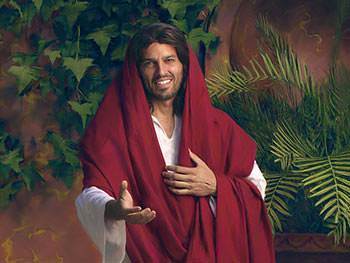 Lesson 5: Who is the Promised Savior? In our last lesson we learned how Adam and Eve disobeyed God. Their disobedience brought sin and death into the world. But God still loved Adam and Eve and He promised that one day He would send a Savior into the world. Who is the promised Savior? 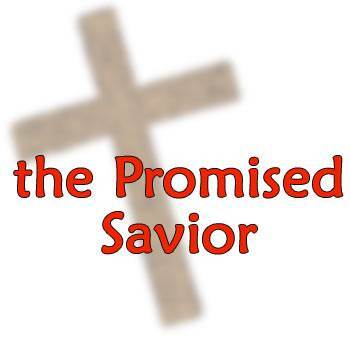 The promised Savior is the Lord Jesus. The Bible says, "You shall call His name JESUS: for He shall save His people from their sins" (Matthew 1:21). Before Jesus came, God told His people to bring lambs and offer them as sacrifices for their sins. Each person had to offer a lamb for his own sins. 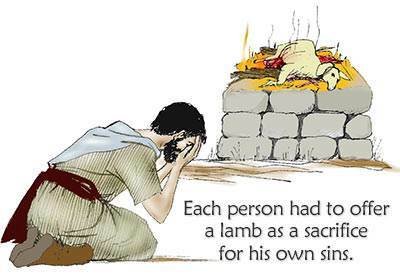 That lamb died for that person’s sins. What was God teaching them? He was teaching them that something must die for sin. The Bible says, "The wages of sin is death…" (Romans 6:23). God was teaching them that one day His Son would come to be our Savior. He would die on the cross for the sins of the whole world. 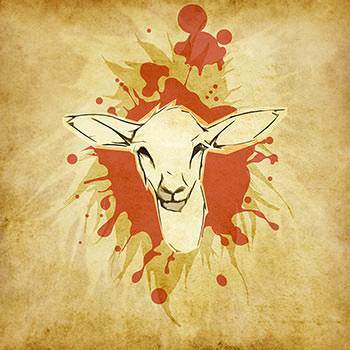 For hundreds of years God’s people offered lambs for their sins as God had told them to do. They knew that something had to die for their sins. They were glad that God had allowed the lambs to be the sacrifices for their sin. But all the time they were watching and waiting for the Savior which God had promised. That Savior would be God’s Son. Mary said, "How can this be, since I am a virgin?" The angel said, "The Holy Spirit shall come upon you, and the power of the Highest shall overshadow you; therefore, that Holy One who is to be born will be called the Son of God" (Luke 1:35). Without touching Mary in any physical way, God placed the baby within her. God gave Mary a husband named Joseph to help her take care of Jesus. As a child, Jesus played with His friends and helped His parents like other children. But Jesus was different from us in that He did not have sin in His heart like we have. Jesus never sinned! He always obeyed His parents. He always obeyed God. When Jesus was about thirty years old, He began to preach and to teach. 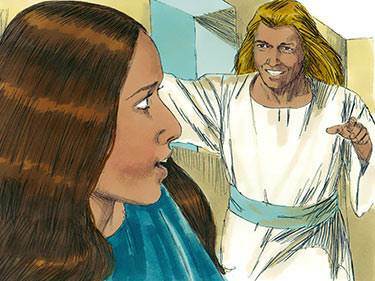 One day John the Baptist saw Jesus. John said, "Behold the Lamb of God, which takes away the sin of the world" (John 1:29). John the Baptist called Jesus "the Lamb of God" because he knew that one day Jesus would die for the sins of the world. Jesus is the only One who could die for our sins because He was pure and holy, and He never sinned. Jesus said that He was the Son of God. He showed that He was the Son of God by doing things which only God could do. The Bible says that Jesus was "anointed with the Holy Spirit and with power," and that He "went about doing good and healing all who were oppressed by the devil; for God was with Him" (Acts 10:38). One time Jesus was with His disciples in a boat. Jesus fell asleep and, as He slept, a great storm arose. 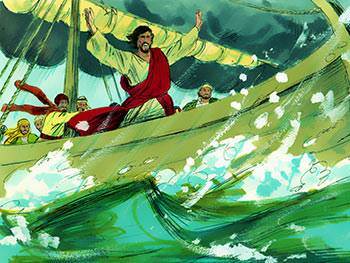 The waves were so high that the disciples thought the boat would sink. They woke Jesus saying, "Lord, save us: we are perishing!" Jesus had power over Satan and his evil spirits. He made evil spirits come out of people. 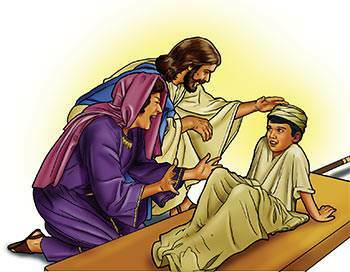 He healed the sick. He made the blind to see, the deaf to hear, and the lame to walk. The Lord Jesus even raised some people from the dead. One day a funeral procession passed by Jesus. All the people were crying. A widow’s only son had died and they were going to bury him. This poor mother had no husband and now her only son had died. The Lord Jesus came to be our Savior. He did not come just to heal people and to do miracles; He came to die on the cross for our sins. The saddest but most wonderful event that ever took place in this world was when Jesus suffered and died for our sins—the wrong things we have thought, said and done. Satan stirred up wicked men who plotted against Jesus to put Him to death. They bound Jesus with strong cords and took Him to Pilate, the Roman governor. They told lies about Jesus and accused Him of many wrong things. 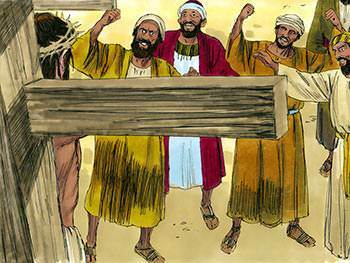 Pilate told his soldiers to take Jesus out and beat Him. The soldiers took off His shirt and beat Him with a leather whip. Wicked men took turns hitting Him in the face. Some even spit in His face as they made fun of Him. Then they made a crown for Jesus—not a crown of gold but a crown of thorns. They took Jesus to a place called Calvary and they crucified Him. His hands and His feet were nailed to the cross. Two thieves were crucified at the same time, one on each side of Jesus. These two men were being put to death because they had done many bad things. But Jesus had never done anything wrong. He was dying for our sins. 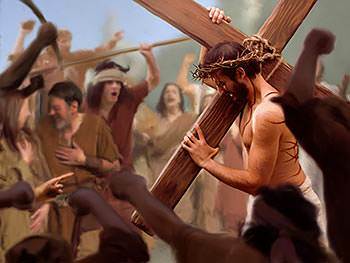 As Jesus hung on the cross, He could see the people who had beaten Him. He could see those who had spit in His face. He could see those who had nailed Him to the cross. He loved them in spite of all they had done and He prayed for them. Jesus said, "Father, forgive them for they know not what they do." Jesus prayed for His enemies. He wanted them to be saved. 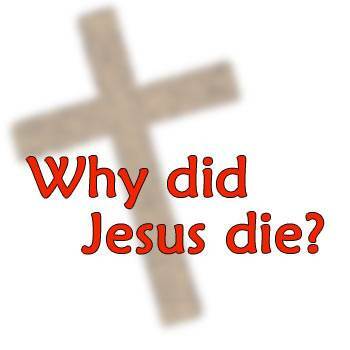 Now we come to a very important question: Why did Jesus die on the cross? He died for our sins. The Bible says that God took all our sins and laid them on His Son, the Lord Jesus. 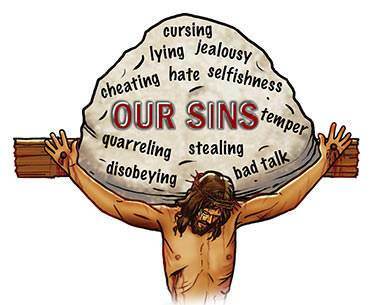 All our lies, our disobedience, our bad talk, our temper, our selfishness—all our sins were laid on Jesus. This is why He died. The Bible says, "…the Lord has laid on Him [Jesus] the sins of us all" (Isaiah 53:6). What is the most important thing we have learned in this lesson? It is this: Jesus, the Son of God, died for our sins. He died for MY sins, and He died for YOUR sins. 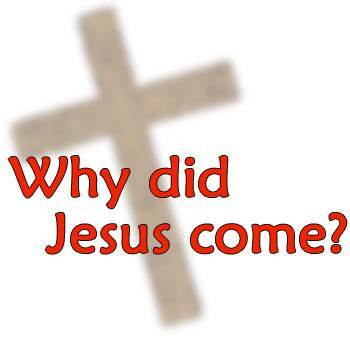 Do you know why the Lord Jesus gave His life on the cross for you? He gave His life for you because He loved you. 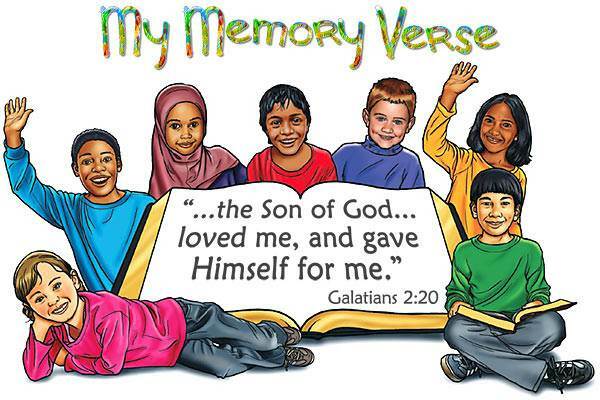 The Apostle Paul said, "…the Son of God…loved me, and gave Himself for me" (Galatians 2:20). You can say this too. Say it to yourself right now—"The Son of God loved ME and gave Himself for ME!" The Lord Jesus not only died for our sins, but He rose from the dead on the third day. He is our living Savior! When you believe on the Lord Jesus and take Him as your Savior, God forgives you of all your sins and makes you His child. You are saved forever. The Bible says, "Believe on the Lord Jesus Christ, and you shall be saved…" (Acts 16:31). If you are not sure that you are saved, talk to Jesus right now. Tell Him that you believe that He is God’s Son. Tell Him that you believe that He died for your sins. Ask Him to come into your heart and be your Savior.